You can find the selected character's various information including character type, KuTen code, Daikanwa number, GT font number, parts, strokes, reading, identified characters and related characters. To magnify the original character, tap the original character at the upper side of the screen. If you touch and hold the character, [Character Manipulation] dialog appears. Tap icon to send the original character to an online dictionary on the Internet and show the search results. † Recently visited online dictionary by selecting "Search by Web" in "Character Manipulation" dialog will open. † The icon appears only when a Unicode character is selected. To distinguish character codes, the following abbreviations are used. If the kanji character is included in the kanji lists established by law, the kanji's attribute is displayed. Kanji characters included in the Jouyou kanji list (Jouyou means regular use or daily use). On November 30th, 2010, the Japanese Cabinet announced "Jouyou kanji list"(the Agency for Cultural Affairs) as the 2nd cabinet notification of 2010. The list includes 2136 characters. 196 characters are added to the traditional list and 5 characters are deleted from the list. Since the Meiji Era, "so-called Kouki jiten" has been used as reference to indicate a connection between the Jouyou kanji and the character shape for printed word. The generic term for the group of kanji characters in the Jouyou kanji, defined as the must-learn kanji for elementary school students by The Ministry of Education, Culture, Sports, Science and Technology in Japan. The appendix of the curriculum guidelines by the Ministry of Education, Culture, Sports, Science and Technology, "Kanji distribution list for each year" includes 1006 characters in all. 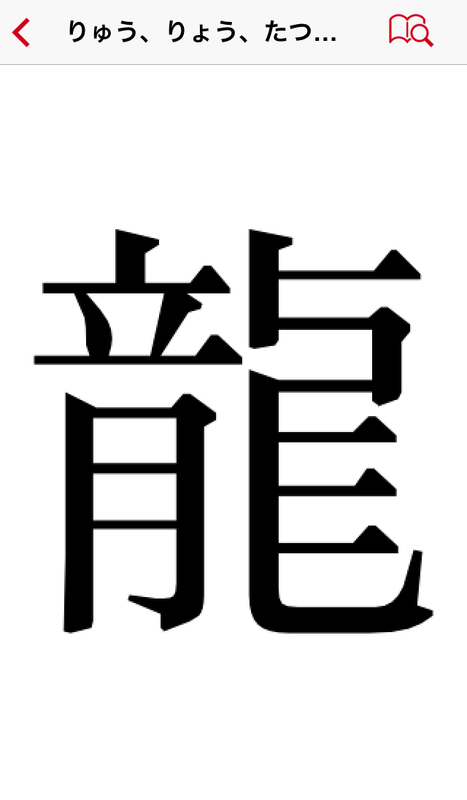 Acceptable kanji for the name on the census register in Japan, not included in Jouyou kanji list. The Ministry of Justice in Japan defines these characters as "Ordinance for Enforcement of the Census Registration Act, Appended Table 2". This Appended Table 2 is divided into "the 1st table" and "the 2nd table". In accordance with the amendment of the Jouyou kanji list, this list was amended on November 30th, 2010. 129 characters are deleted from the list (3 characters out of 129 are moved into Appended Table 2-2, as the variant character), because they are added to the Jouyou kanji list. 5 characters are added to the list, because they are deleted form the Jouyou kanji list. As the result, the list includes 861 characters. On December 8th, 2000, the Japanese Language Council recommended a certain amount of guidelines for "the criterion for selection of character shape" regarding non-Jouyou kanji as "Character shape list for non-listed kanji"(The Ministry of Education, Culture, Sports, Science and Technology). In the list, the character shapes are defined as "so-called Kouki jiten", not exactly the same shapes in the original Kouki jiten. Since the Meiji Era, "so-called Kouki jiten" has been developed based on the original Kouki jiten. Simplified character style for print in "Character shape list for non-listed kanji"(The Ministry of Education, Culture, Sports, Science and Technology). They can be used with no trouble as an alternative for the standard printed form. Regarding the characters with a radical(a part of kanji) called "Shin-nyuu/Shimesu-hen/Shoku-hen", when the character shapes of " / / " are the standard printed form, the character shapes of " / / " are also written (permitted three radicals). If the permission character style is used as printed character, you don't have to change the character into the standard printed form. Five characters, / / / / are defined as Permission character style in the Jouyou kanji list. You can find the list of identified characters at the first area of Character Info from the top. † Identified characters are the characters which have the same shape in appearance. † Tap the character in the list to search newly the character info. The following pictograms are used for indicating the meanings of each character info. You can find the information on the related characters at the second area of Character Info from the top. † Related characters are the characters mutually related to meaning or character shape. 隷字(れいじ)："Reiji" Clerical script：Simplified "Tenji" and their original "Tenji"
通用字：Popular use：Relations between kanji characters for exchange in meaning or reading. Daily used kanji and mistakenly-established character shape. 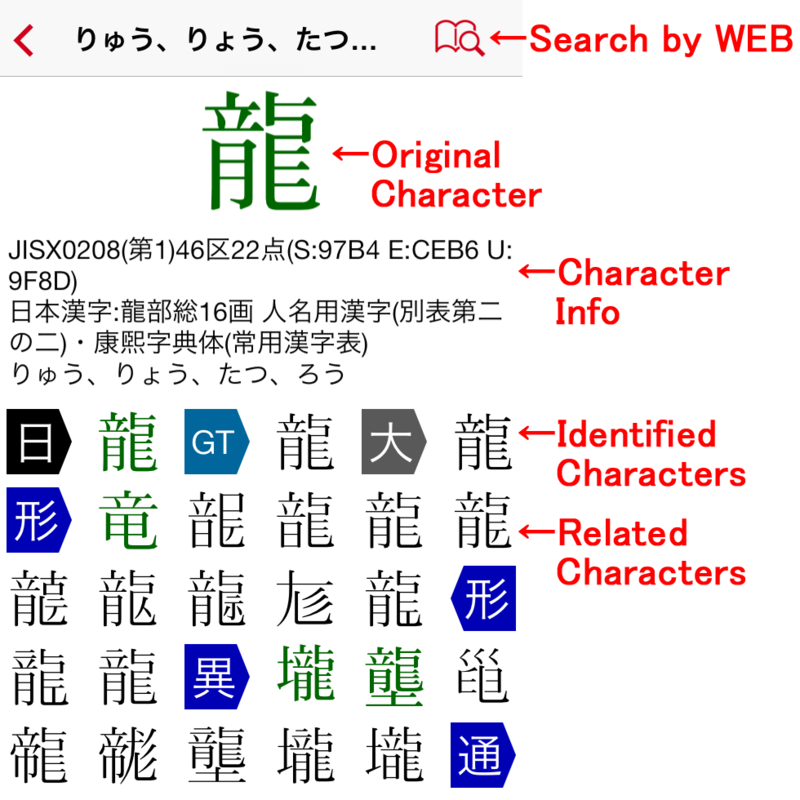 † The right-pointing pictogram means the character derived from the relation with the original character(the character in Character Info Area). The left-pointing pictogram means the original character as the derived result in relations. For example, if there is the character displayed as B relative to the original character A, the character B means the variant figure of the original character A. If there is the character displayed as C relative to the original character A, the variant figure of the character C means the original character A.